West Virginia State University received a A.
Washington Monthly's ranking of 120 out of 277 of National Universities - Overall Rank was a major contributor to this grade. 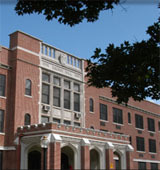 Located eight miles south of Charleston in the small town of Institute, West Virginia State is a historically African-African multi-purpose liberal arts college educating some 4,000 undergraduate students, the average age of whom is 26. Outside of class, leisure options range from an art gallery to bowling facilities. What are the top 3 reasons someone should attend West Virginia State University? The class sizes are very small and personalized. The campus is spacious but still a comfortable walk around. The students and atmosphere are amazing! What is a typical West Virginia State University student like? Describe the type of person that should attend West Virginia State University. Usually commuters attend my school. Adult and returning students are also very common as it is near the capital of West Virginia. What are the top 3 things that students do for fun at West Virginia State University? The students here at WVSU enjoy the on campus activities that are put on my the student body. They also enjoy performing physical activity whether it be on the main lawn or in the weight room. The average student pays $7,910 for tuition, fees, and other expenses, after grants and scholarships. Total stated tuition is $5,932, in-state and on-campus, before financial aid. Learn more about financial aid at http://finaid.wvstateu.edu/. Estimate the net price for you at http://wvstateu.studentaidcalculator.com/survey.aspx. The typical (median) early career salary of West Virginia State University graduates is $34,800, according to Payscale. West Virginia State University participates in the NCAA Division II for college athletics. Want more info about West Virginia State University? Get free advice from education experts and Noodle community members. What are some examples of previous projects done in the West Virginia State University “Research Rookies” program? What does the school look for in a “Research Rookie” applicant? The Research Rookie program is for incoming first years, rising sophomores, or transfer students with less than 60 credits. This program allows students to work with faculty to do scientific research that they are interested in.